I really love a good zoo. I’m also fond of wildlife parks, walk-through aviaries, and even butterfly houses. I’ve been to the world’s oldest zoo (Tiergarten Schönbrunn just outside of Vienna, Austria), the world’s largest zoo (San Diego Zoo in California), and a fair number of innovative or well-regarded zoos in a number of other places. 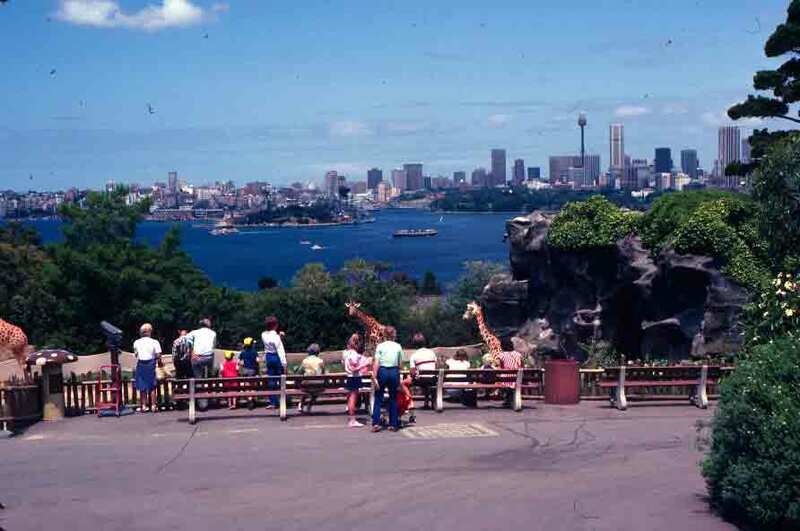 But among them all, the one with the best view has to be Syndey’s Taronga Zoo. The name of the zoo actually sums up the place pretty well– it’s an Aboriginal word for “water view.” The zoo meanders up a hillside that faces Sydney Harbour, and from almost all points in the zoo, one can look out over that handsome expanse of water, with the city of Sydney in the background. A while back, I posted a photo of a view of the Sydney Opera House that I found amusing. 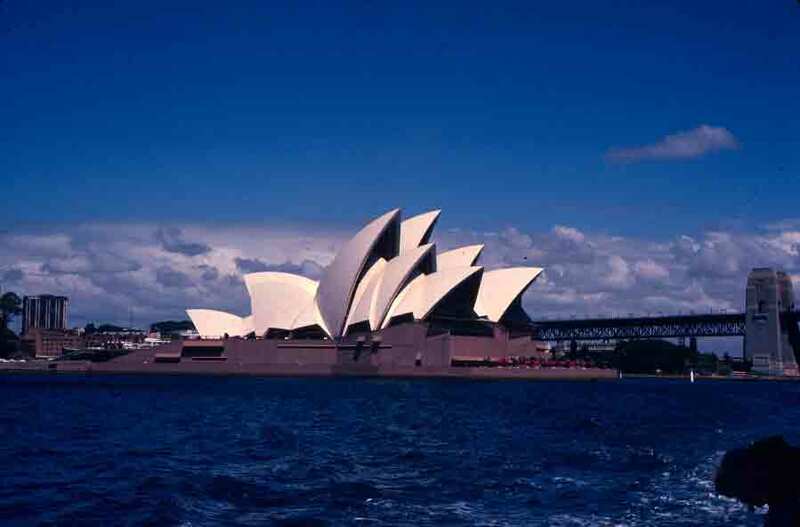 But today, I offer the photo everyone expects–beautiful image of the Opera House floating between sea and sky. The photo below was taken from the ferry while I was in transit from Circular Quay to the Taronga Park Zoo, on the far side of Sydney Harbour. It couldn’t have been a lovelier day. One of the things I’ve discovered while traveling is that pretty much any city that has an important seaport will also have an imposing Customs House. The styles vary by country and/or era, but three things don’t seem to change: an impressive size, a central location, and the original intended purpose, which is handling the imports and exports pouring through the seaport. 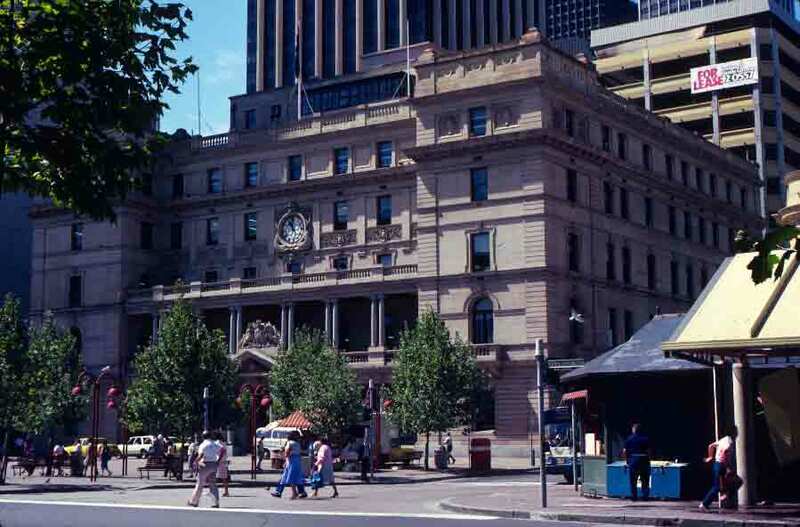 Sydney’s Customs House, which dates to 1844–1845, is front and center at Circular Quay, with a view of the bustling harbor. The handsome building, renovated prior to Sydney’s hosting of the 2000 Olympics, has now been repurposed into a multifunction facility that includes galleries, a museum, a library, performance space, a rooftop café, a Parisian-style bar/bistro, and a huge model of the city of Sydney, displayed beneath the transparent floor in the entryway. Customs House is open to the public, and galleries and the museum are free. Because it is hard to visit Sydney and not find yourself occasionally down by Circular Quay, I had seen the building several times before I found out what it was. In fact, it was hard to miss it, even if one didn’t stop. So while it might not be high on your list of things to see in Australia, at least you know it won’t be hard to find. And, if you simply dash past it on your way to your harbor cruise, now you’ll know what you’re passing. Well, before my trip carries me back into Sydney, I figured it’s a good time for a news flash. DNA evidence reveals that the bones of Ned Kelly have been found. If you’re Australian, if you’ve read my book, or if you’ve seen one of the movies, you’ll know that Ned Kelly was the Australian-Irish nationalist robber/murderer who became something of a folk hero in some quarters. Kelly was hanged for murder in 1880 and his body was interred with others executed at the Melbourne Gaol. Recently, the old grave was rediscovered, bones were exhumed, and one skeleton was proven to be that of the notorious bushranger. This may not sound like a big deal to readers outside Australia, but inside Australia, at least for those who view him as a folk hero, it’s a bit like finding the burial site of Robin Hood. There is plenty of information available on Kelly, including the appendix entry “Ned Kelly and the Bushrangers,” if you happen to have a copy of Waltzing Australia handy. If not, here’s a quick rundown from Encyclopedia Britannica: Ned Kelly. Then, of course, one of the articles on his bones being identified, this one from the Associated Press: Australia IDs Bones of Robber/Folk Hero Ned Kelly, and this one from Yahoo News: Body of infamous Aussie outlaw Ned Kelly found.